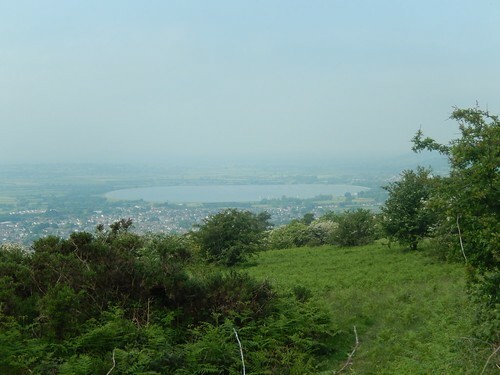 This is the first post in a series of three that will document the route of the Mercury Mendip Challenge. 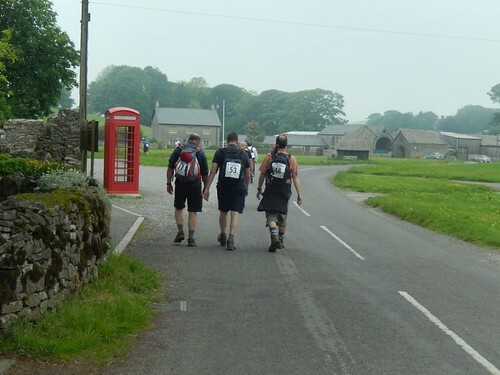 In this post, I’ll share only the first ten-miles of the full-distance challenge. It’s worth noting that this section is commonly regarded as being the most challenging and is exclusive to the thirty-mile walk. 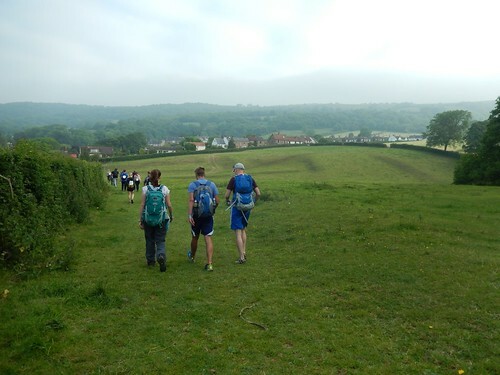 Having arrived at Westhaven School between 6.00 and 6.45am, you will have collected your bib number, wristband and route guide if you’re less familiar with the walk. Soon, you’ll be hoping on one of several provided coaches and en route to the centre of Wells. 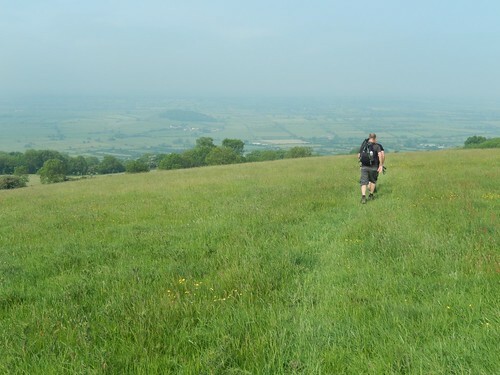 This is where the walk begins, at the other end of the West Mendip Way. We started around 7.45-.7.50am. 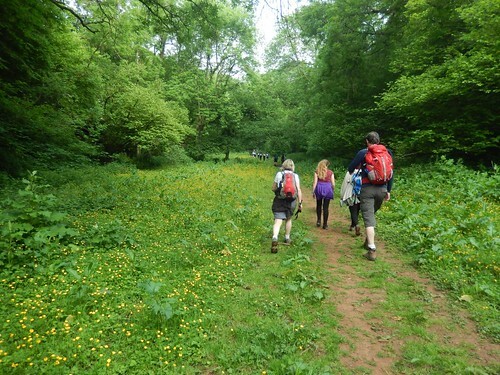 Initially, this walk is easy going, as you follow paved paths across the grounds of The Blue School, heading north towards Wookey Hole. 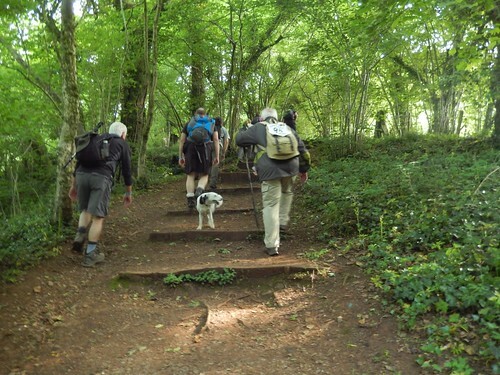 As you reach Lime Kiln Lane, there is an option to leave the West Mendip Way briefly and follow the road in to Wookey Hole. This is advisable in the event of wet weather and mud. 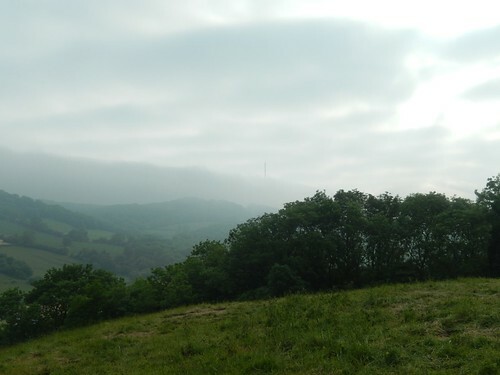 Otherwise, you can do as I did (along with a very few others) who follow the Way up and over Arthur’s Point – from which, – gained this view of the Pen Hill transmitter, barely peaking above the mist. We’re talking minutes, here. 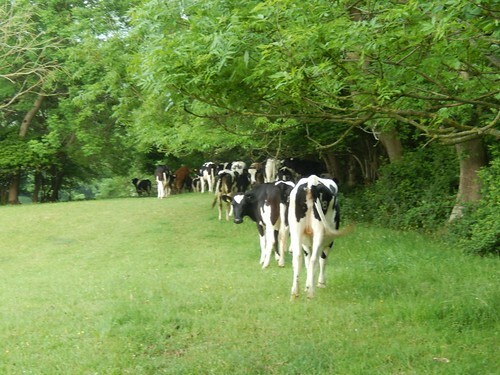 If you do stay faithful to the less-favoured path though, you may have to negotiate a herd of young cattle. Back on or resuming the WMW, it’s then slightly downhill in to Wookey Hole and, after reaching the road, you’ll soon find your first (optional) checkpoint beside the large car park. Behind which, you can also find actual toilets – with plumbing and all. At later checkpoints, you’re unlikely to find anything more than a portaloo. Maybe two, if you’re lucky. No more than an hour in to the walk, it may seem unnecessary to stop at this point, unless you’re carrying the minimum of water and food supplies, perhaps. 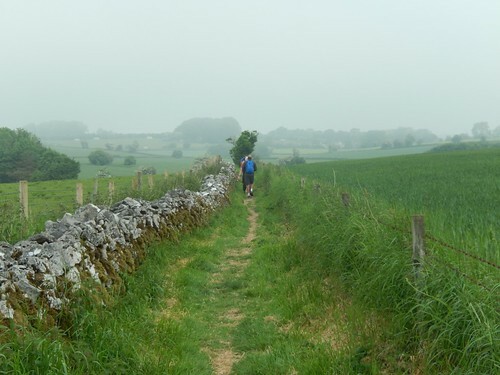 However, I’d encourage you to think about what lies ahead – once you’re following in the footsteps of the twenty-milers, nearly ten-miles on; you’re likely to find that sweets and water and in less of an abundant supply. You may want to consider taking something now, in case it’s not available later. Passing the entrance to the famous show-caves of Wookey Hole, you’ll soon leave the road, following a woodland path in the direction of Ebbor Gorge. 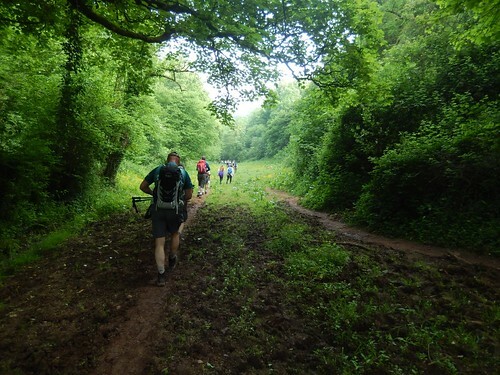 While Ebbor Gorge may not be as grand or well-known as its cousin up in Cheddar, it does contain one of the cruellest ascents in the Mendip Challenge, as you arrive at a flight of large and seemingly-never-ending steps. At the very top, the route continues to the right. To your left, there is otherwise a welcome viewpoint that requires only a short detour. 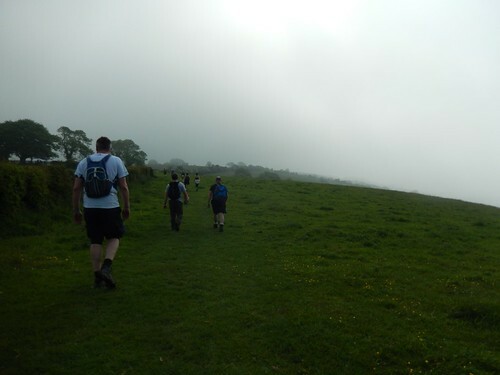 If the morning is as misty as on Sunday though, you may prefer to give it a miss and soldier on along a more favourable and slight incline. Heading towards and then through Priddy, you’re following a largely exposed and level walk for a good hour, maybe more. A year ago, we were wrapped in waterproofs and ponchos with a downpour of rain to accompany the mist. This year, we were far more fortunate with the weather. 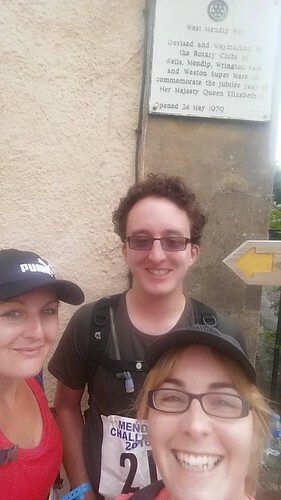 Just before reaching Priddy Green in the centre of the village, your next checkpoint (again, one that’s optional but exclusive for thirty-milers) can be found outside The Queen Victoria Inn. From the green, the Way turns west in the direction of Draycott. 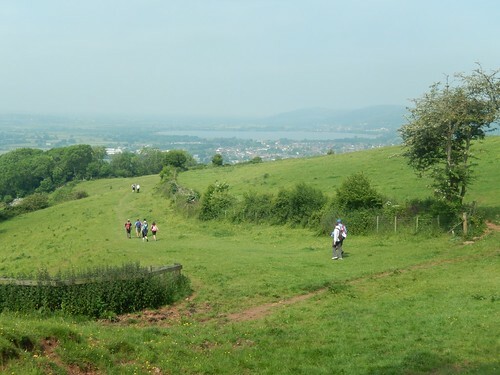 On a clear day, this route is easy to follow and you’ll also be able to admire views across the Somerset Levels, far down to your left. 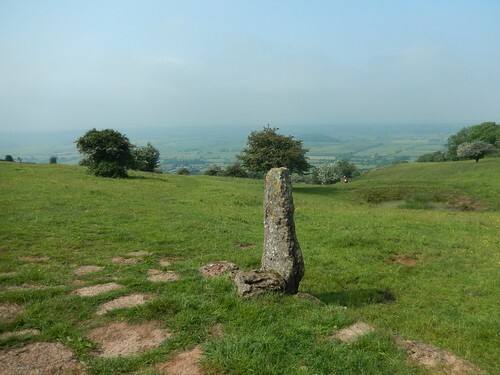 As you near the rocky heights of Draycott Sleights, you should be aware that you need to turn left and head down the hill towards a stone stile – it’s also worth mentioning that there are a number of large stone stiles between Priddy and Draycott. This path isn’t easy to find, if you’re unfamiliar with the path and there’s no fingerpost to lead you the correct way. 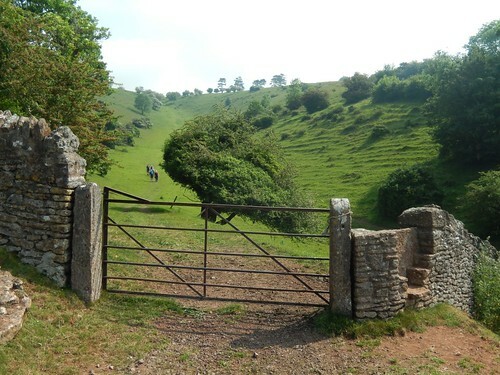 But if you come to another stile (or kissing gate) with an absence of ‘West Mendip Way’ markers, you’ll know you’ve probably gone too far. 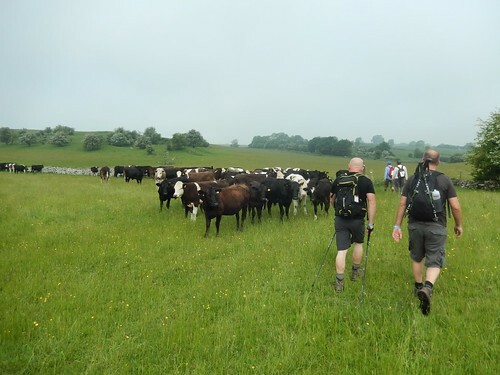 See, not only is the guide you’re given quite good at helping you along but the West Mendip Way is very well signposted. Sadly, the same cannot be said for the East Mendip Way. Suddenly, you’re heading downhill, on to Sun Batch and then further, to the A371. There’s a checkpoint further north (right) along this busy road and close to a cider barn. It is compulsory to stop at this checkpoint and have the appropriate tab removed from your wristband. Two-years ago, this was merely an optional checkpoint and, as I huffed and puffed my way up and across the next hill with many others, I witnessed a number of others who had cheated, following the ridge along the top of the hill (and an alternate footpath) instead of dropping down to the road and then climbing back up. 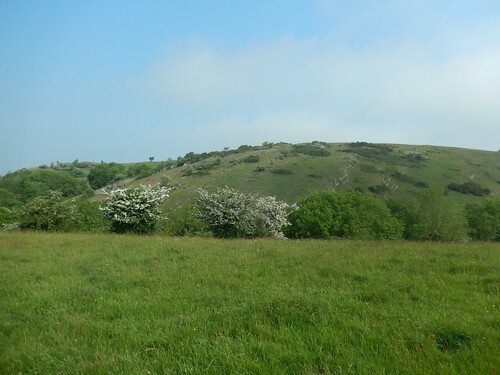 Next is, without doubt, the toughest ascent in the entire Mendip Challenge. 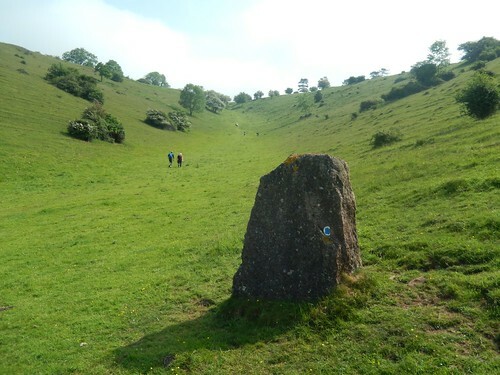 A lot of walkers seem to miss or ignore the standing stone that directs you right, up and around Batcombe Hollow. They favour a non-permissive route (trespassing) straight up the valley… I’ve witnessed this now, for three consecutive years. I don’t believe there’s an easy way to the top but I’m pleased that I managed to do it this year with only two pauses, on an ascent of more than 250m. 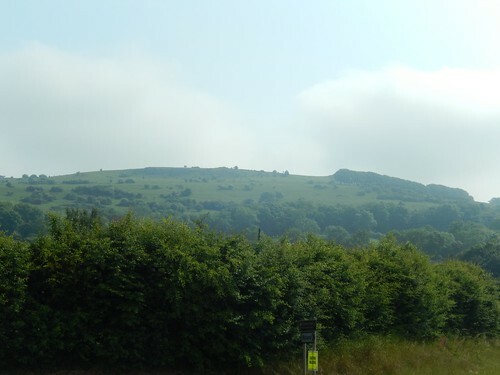 Even as you near what, at first, appears to be the brow of the hill; you soon realise that it keeps on climbing – although more gently – to a gate near the top-left corner. One more climb awaits you on the other side, as you head for salvation, with a T-junction at the field’s top-left corner. 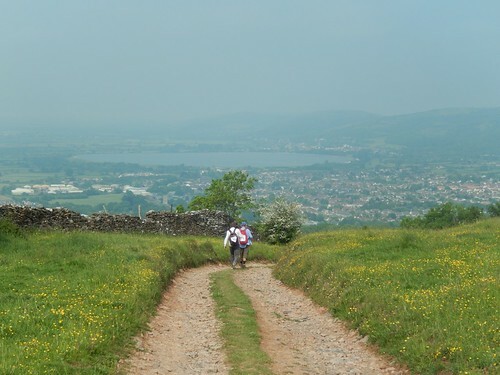 With Cheddar in sight for the next few miles, you may feel as though you’ve conquered a lot already. These views are very rewarding, regardless of the weather. 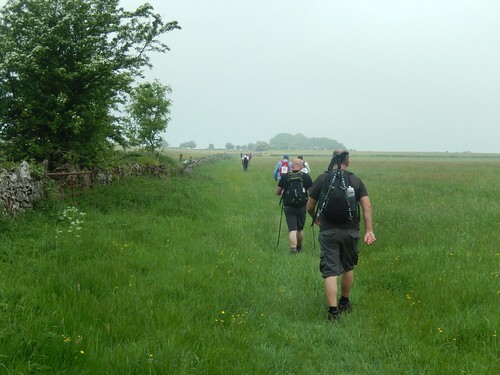 After some level walking to re-capacitate your lungs, you’ll find the walk begins to slide downhill again, heading for Bradley Cross. 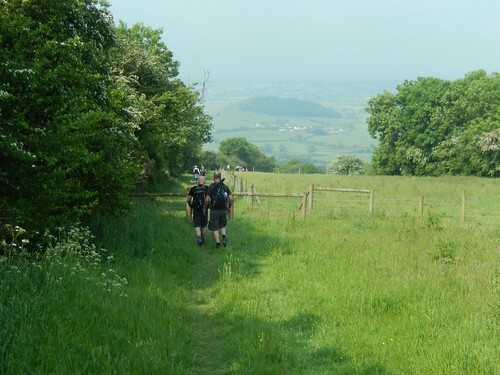 Although not as severe as the climb up from Draycott, the ascent to and beyond Bubwith Acres Nature Reserve may take you by surprise. An OS map or guidebook is almost essential here, as the waymarking becomes inconsistent, the closer you get to Cheddar Gorge. There’s a sharp, rocky and – in the event of wet weather – maybe slippery descent down in to the heart of Cheddar Gorge soon to follow. Some make the mistake of turning left down a narrow and unsigned road but your best bet for reaching the imminent checkpoint at Black Rock is to stick to the wide path as it veers right. Do watch out for ‘day-trippers’ on their way up to explore this local attraction. Black Rock marks the beginning of the 20 Mile Route, which I’ll document in my next post. You’ll have done very well to make it this far! It won’t exactly be easy from here on but, you’ve certainly overcome the worst. You may feel further encouraged to know that you’ll have actually walked more than 12.5 miles by now!